Take a 2012 Subaru WRX STI and add 600 horsepower to the already fast car and you get the exciting Global Rally Cross race series that has more action than the new James Bond Skyfall movie. Subaru is bringing their team to Las Vegas to put on a thrilling show for this year’s SEMA attendees. This will be the first time the event is held at the SEMA Show and it will bring one of the most exciting tracks to the GRC events yet. The Subaru PUMA RallyCross Team has three drivers who will compete with their 600 hp Subaru WRX STI Rallycross cars. 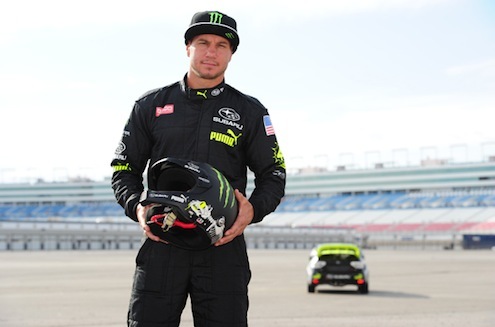 Subaru PUMA RallyCross Team drivers Sverre Isachsen, Dave Mirra, and Bucky Lasek, are eager to race their cars on the unique Las Vegas course. The 0.6-mile GRC track will feature more dirt than any previous GRC rounds, and will be constructed in a parking lot directly across from the SEMA show’s convention center. The Las Vegas track will feature both dirt and tarmac sections, a water splash, and a massive dirt crossover gap-jump. The use of multiple loose surfaces should provide plenty of spectacular action. All the cars in the race are highly modified, high-performance production-based all-wheel-drive cars. The three 2012 Subaru WRX STI Rallycross cars will square off with five other cars in the preliminary elimination heats with 10 cars lining up for the Final. The Global Rallycross Championship provides an exciting combination of circuit racing, off-road racing and rally competition and features wheel-to-wheel racing. The SEMA Show attracts more than 100,000 auto industry leaders and is the premier automotive specialty products trade event in the world. It's the perfect event to show off the high-performance 2012 Subaru WRX STI Rallycross cars. The GRC race will be broadcast live on ESPN2 and ESPN3 on Tuesday, Oct. 30 from 5 pm to 6:30pm (PDT) / 8 pm to 9:30 pm (EDT).